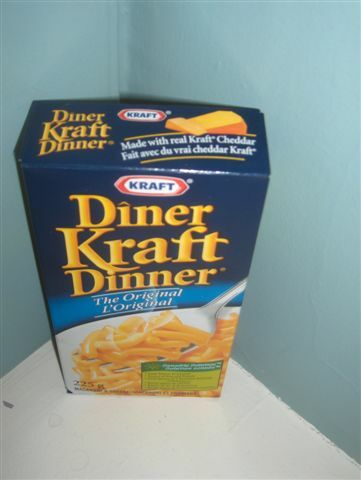 This entry was posted on	January 18, 2007 at 5:58 pm	and is filed under about last night, advice, arts and crafts, buffet, butter, cheese, choices, cook, cooking, cream, dinner, extra cheese, food, George Segal, KD, Kraft Dinner, macaroni and cheese, margarine, meal, milk, onion, recipe. anyone keeps a cast iron skillet hid somewhere-you need one! TAKE THE SKILLET and pour the pineapple into it. Pour the cake mix on top of pineapple. Slice butter/margerine on top of cake mix. Situate (notice I said situate) the skillet over the fire-this is where the ‘skill’ in skillet comes in play…watch the cake mix and as the can of pineapple starts to bubble up and the butter melys down…soon you’ll get the grip of it. DO NOT FORGET-pour the whole can-juice and all-into the pan. The juice replaces eggs and milk and the fire replaces an oven and the ground where you build the fire replaces a kitchen. Traffic going by on the roadway as you cook this fun delight replaces TV programs…tons of fun! Please-God please…keep our friend Tony warm somehow. Well I guess Tony wasn’t to hungry last night after 4 boxes of KD! But i guess this is where I just don’t get it? Familys od 2 oe 3 eat 1 box of KD and are happy. It seem to me that tony is doing ok lots of people are giving him food and money a place to sleep at times. May be we need to look at some one who is in more need ? When I read comments like “Just me” wrote, I have no question as to why homeless people are regarded with such prejudice. Perhaps, just me, you eat while you’ve got it … because there’s no promise you’ll have it tomorrow. But even if it is purely by choice … four boxes of Krap Mac and Cheese do not lift Tony above the level of need of which you speak. There is this strange set of thinking, regarding the poor, that really bothers me as it appears so unfair: “oh, he got to eat one night, maybe he’s not as bad off as we think…” The illness of poverty is often rooted in this bias and not with people, smart people, who have slipped through a fragile and changeable social net. I always think but for the grace…you know. Why would anyone begrudge anyone food??? We really need to focus on the problems and not the blame. That’s a LOT of KD. oh yeah, I forgot to say that…mmmmm KD…. sounds like a filling feast! NOW……………spill the beans on working with George Segal and the buffet……….my curiosity is piqued! Sounds like a slice of heaven. god knows it’s well deserved.